Grouches-Luchuel is a village and commune about 5 kilometres north-east of Doullens, a small town 30 kilometres north of Amiens. 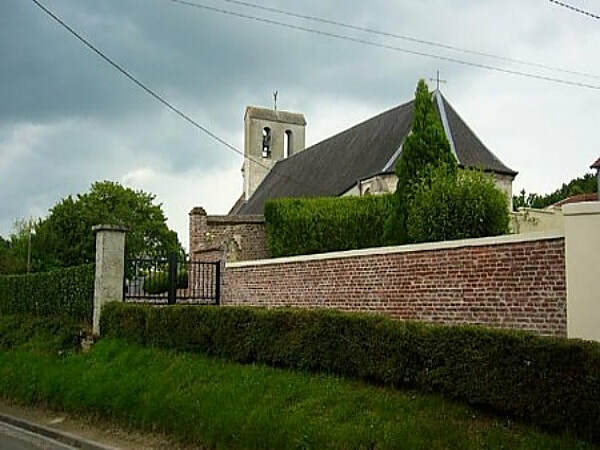 The village is on the D.5 road from Doullens to Avesnes-le-Comte. Grouches is the main part of the village and is on the western side of the river Grouches, while Luchuel is on the eastern side. The churchyard, as its name indicates, is in Grouches, and the three British graves are some 8 metres north-north-west of the church door. 6347351 Private Ernest Charles Francis Cook, 6th Bn. Queen's Own Royal West Kent Regiment, died 20th May 1940, aged 20. Son of Ernest W. Cook and L.ucy M. Cook, of Carshalton Beeches, Surrey. INSCRIPTION. HE IS REMEMBERED EVER BY THOSE WHO LOVED HIM WELL. MUM AND DAD. 6344738 Private Ernest George Hill, 6th Bn. Queen's Own Royal West Kent Regiment, died 20th May 1940, aged 20. Son of William George Fredrick and Annie Lizzie Hill, of Biggin Hill, Kent. INSCRIPTION. WE OFT SEE HIS SMILE SAYING GOOD-BYE, AS HE LEFT HOME FOR EVER IN A FAR LAND TO DIE. 6347552 Private William Valentine Slack, 6th Bn. Queen's Own Royal West Kent Regiment, died 20th May 1940, aged 22. Son of William and Florence May Slack, of Bromley, Kent.